Optional toppings: sugar-plum tomatoes, walnuts, currants, hemp seeds, chopped raw broccoli, sliced carrots. Whisk all of the ingredients together until smooth OR mix in a blender. Add more water for a thinner dressing. Store in an airtight container in the refrigerator. *If you’re not a fan of tahini, you can easily replace it with raw cashews or vegan mayo. If you use vegan mayo, start with a smaller amount of water and omit the maple syrup. Blend until smooth. You can also do a simple balsamic vinegar/avocado oil (or olive oil) dressing OR fresh lemon juice to keep it light. Cook the quinoa according to the package and allow to cool before assembling. I recommend cooking the quinoa the night before. We use a rice cooker to make ours and it always turns out fluffy and perfect! 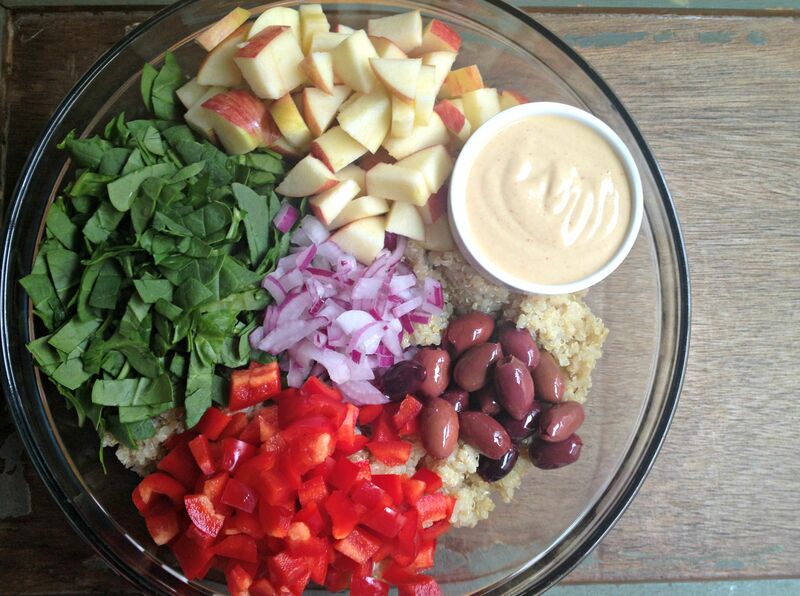 Chop the apples, pepper, onion & spinach and add them to the quinoa in a large mixing bowl. Stir in the olives and any additional toppings. You can serve as is and allow people to add their own dressing or mix in your desired amount of dressing to the entire salad. Top with fresh ground black pepper. ENJOY! Any salad dressing leftovers should be refrigerated and used within 4-5 days. 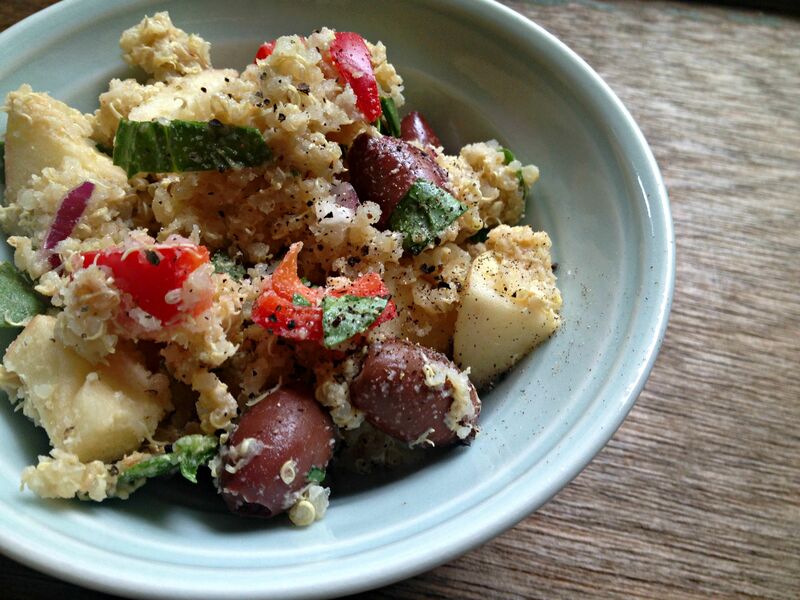 The quinoa salad itself should be consumed within 3-4 days for maximum freshness and taste. This makes a BIG salad and lasts us a few days for lunches that Josh takes to work. You can easily cut the recipe in half for a smaller salad. The longer it sits in the fridge, the more flavorful it becomes. I enjoyed this one day in a gluten-free tortilla with extra spinach and romaine – it made a delicious wrap! Ok, I think that’s enough tahini love for a bit…we’ll move on to other obsessions soon! Oh yummy! Willow is a genius for thinking of this and you are a genius for creating it! Mandy, this looks amazing!! I love the sound and look of that dressing too and think it’s one of the best sounding tahini dressings I’ve seen…most I’ve tried out there have been really off and I always believe tahini needs a bit of sweetness to balance out it’s bitterness, so I love that you added that! Looks so good I could probably drink it! Can’t wait to try it! I’m drooling over this dressing!!! Everything you put in it sounds so good together! Perfect over a salad too. YUM! I have another one coming tomorrow or Tuesday! This looks really good! Perfect timing because I’ve been craving and looking for new fun salads to try for lunch. This one sounds perfect! Hoping to try it out next week sometime Mandy! 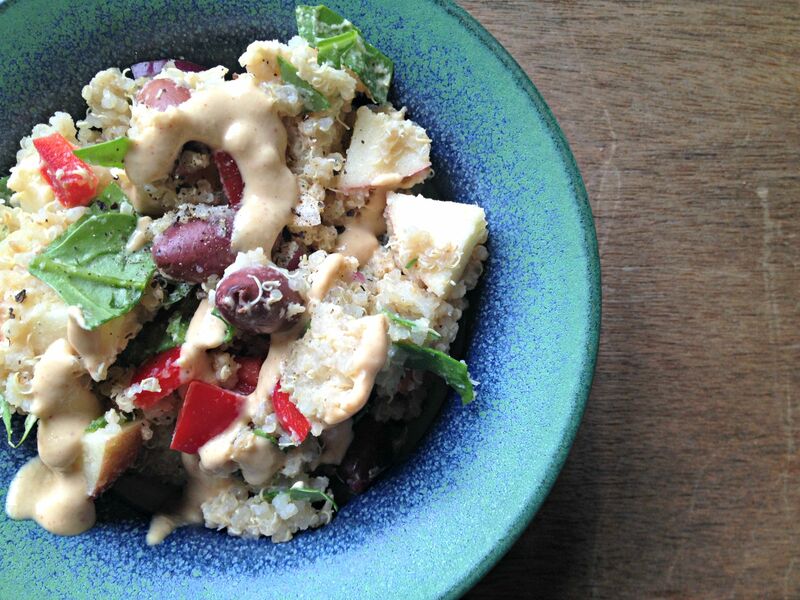 Love all your quick tahini dressings! !